Monday afternoon I decided to read through all of my unread emails. This generally just means coupon type things and some mailing lists I don’t follow religiously, but it also included emails from Austin Film Society. There are always local screenings of things and I don’t always pay the greatest attention. 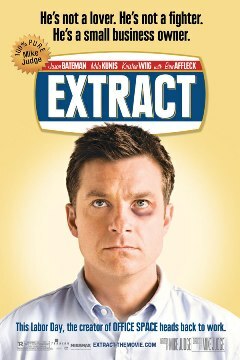 But, I noticed that one of them mentioned a World Premiere of Extract. That sounded interesting. I realized it was for Tuesday, the next day, and figured it would be all sold out. It wasn’t, surprisingly. It’s the WORLD Premiere of the film, I just assumed that would mean something. Mike put some feelers out to see who of our friends would want to go. Only one other couple was game, our friends Josh and Libby — recently wedded. They are big movie folk, so they were all for it. The ticket prices were quite steep – $35 – but I realized that it was all going towards the Texas Filmmakers’ Production Fund. That’s a great cause, so that makes the hit of the price a bit softer. I’ve seen quite a few premieres of various sorts at the Paramount before, but I’ve never really tried to catch the red carpet stuff. Libby was really wanting to stick near the red carpet to see Jason Bateman when he arrived, so we waited out there with them. We got a good spot right inside the door, against the barrier thingies. For the 10 feet worth of red carpet, it took Mr. Bateman like 30 minutes to get to where we were. I swear he is more adorable in person than anything on the screen. So friggin’ cute! We also saw Patti Griffin, and Mike Judge while we were waiting out there. YARRRRRRRR! Thar be SPOILERS ahead. Ye’ve been warrrrrned! Now, let’s discuss the meat of the matter — the movie. Hmmm. It’s been a couple days, so I’ve had time to do some thinking on this. I didn’t like it. I liked certain bits here and there, and Jason Bateman was awesome. And, shockingly!! !, Ben Affleck kinda stole the show. Now, let me see… why didn’t I like it? It was weak. The story was so jumbled and loose that it just felt like a high school student’s assignment. Mila Kunis character almost seemed completely useless. I mean, I know we have to have a love interest or affair interest in this case, but her part seemed completely tacked on. There was this gigolo that Ben Affleck’s character hired to bang Jason’s wife, played by Kristen Wiig. There was almost an element of… “Is he really banging HIS wife, or someone else?” But it wasn’t really a forced mystery, so it seemed just so badly drawn out. I’m probably not explaining this well. But, let’s just say everything in the film felt too middle of the road. Like someone had a choice in what direction to go for particular story ideas, and instead of making a confident decision… they just decided to split the difference. Which makes for a very poorly constructed weak story.Â Even some of the really funny stuff in the previews, wasn’t nearly as funny in context. Which doesn’t happen often, but it hurts when it does. I love Mike Judge. I still watch King of the Hill, and I even really liked the poorly received Idiocracy. Not cuz it was a great movie, but the ideas behind it still make me think. The quick and dirty of that movie is that all the smart people don’t breed fast enough, and over time all the really stupid mofos have breeded like bunnies and everyone in the future is pretty much the worst simpletons you can imagine. Even the people in power. Scary, scary ideas mainly cuz I can definitely see that happening. Oh, but it is a comedy. Anyway, yes, fan here. So this film is just kinda heartbreaking. He’s just so much better than this film. Hell, everyone in the film is better than this.